Located in the heart of the city, the Wiener Konzerthaus is a genuine institution. Built in 1913, the majestic concert hall is a sophisticated mixture of Art Nouveau style and Vienna Secession, an artistic movement that was popular around 1900. This extravagant Viennese hotel is superbly located to discover the city's art, music and architectural treasures. The location at the "Konzerthaus" welcomes guests in an elegant Art Nouveau setting! Embark on an art nouveau journey and discover the work of famous artists like Klimt and Schiele. Enjoy our Austrian hospitality at the Hotel Am Konzerthaus Vienna MGallery by Sofitel. Welcome to Vienna!.. A visit to Vienna will immerse you in the extravagant ambiance of the Art Nouveau era. The city hides a wealth of art treasures from the world-renowned Vienna Secession, including Gustav Klimt's "The Kiss" in the Belvedere Museum. 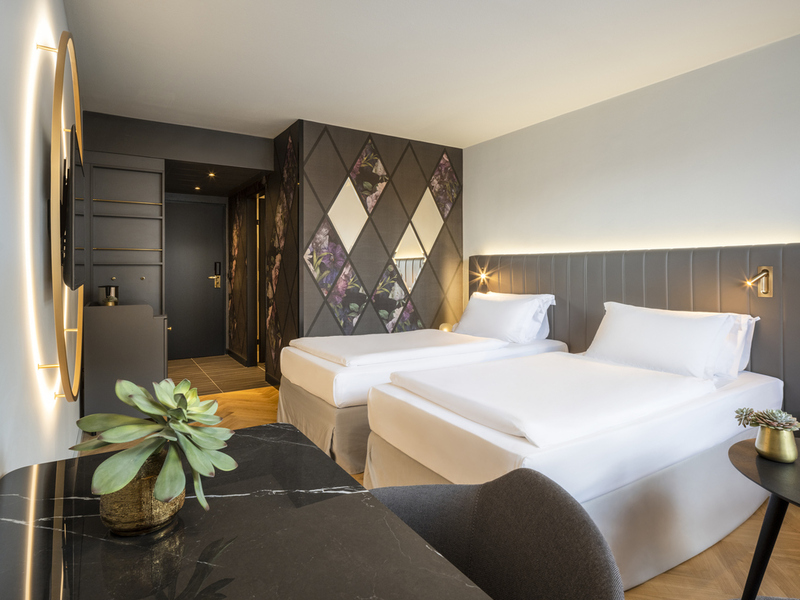 The central Hotel am Konzerthaus MGallery by Sofitel proudly celebrates the Vienna's Art Nouveau legacy in a contemporary style. With its extravagant decor and modern comfort, it is the perfect base for discovering the attractions of the city. Visit the Wiener Konzerthaus, a majestic concert hall that lends our hotel its name. Knowledgeable guides can accompany you on a wander through this impressive building, which is home to both the orchestra and music festivals. 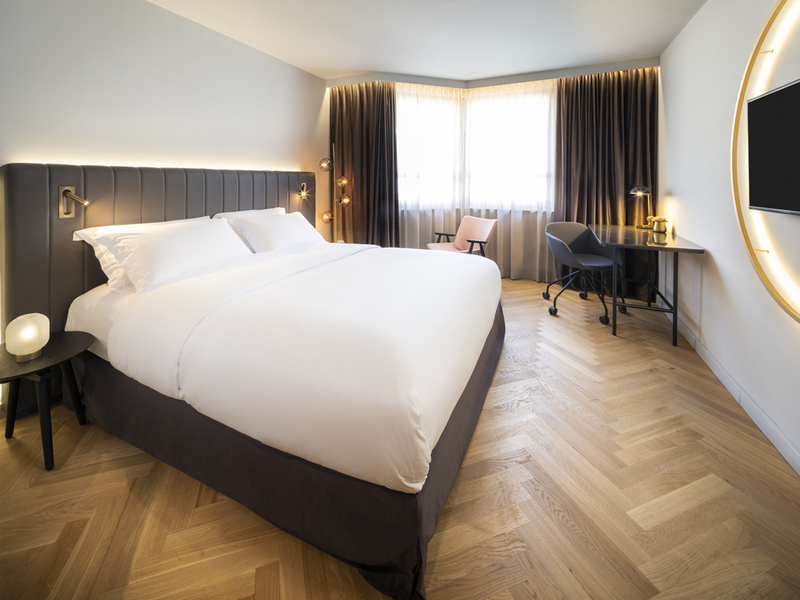 In the evening we'll spoil you with a gourmet dinner in an opulent setting or a cocktail in the Apron bar, and after a restful night in your large room you'll be ready for adventure in this exciting city. Stunning Schönbrunn Palace, peaceful parks, gourmet terrace restaurants and cafés... The Austrian capital is a timeless and romantic destination. From museum exhibitions to classical music concerts, you will be spoiled for choice in gentle Vienna. 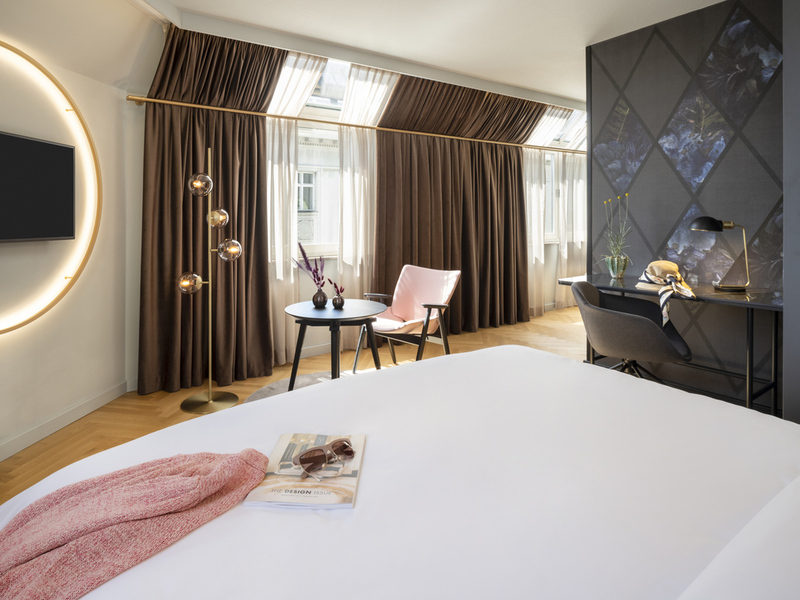 Arranged in the style of Viennese Art Nouveau, the Superior Rooms convince with an impressive painting of Gustav Klimt and are captivating due to their quiet location. Our spacious Deluxe rooms are tastefully decorated in Art Nouveau style and feature fine works from famous Austrian painter Gustav Klimt. Don't forget to pamper yourself with our "Good Night" package! The quiet and spacious room is decorated in the art nouveau style with its own Klimt artwork. The bathroom features a bathtub or shower and you can treat yourself to C.O. Bigelow products. A rollaway bed is available on request. 248-291 sq. ft (23-27 m²), Art Nouveau Room, Klimt picture, free WIFI, free coffee/tea and mineral water, minibar, safe, telephone, TV, radio and in-room entertainment program, large selection of C.O.Bigelow toiletries in bathroom. Bistronomy with 2 Gault Millau toques for uptown tastes: A modern interpretation of Austrian cuisine with an international touch. Our bar has something for everyone, from fantastic cocktail creations to elegant glasses of wine. Experience bistronomy at its finest. The Symphony Room features distinctively large windows that stretch along two sides of the space, and with 51 m² it can accommodate up to 50 people when set up for theatre seating. The Melody room has plenty of natural light and is an ideal location for your business meetings, training seminars or presentations. The décor provides for a comfortable atmosphere. Relax after your big day against the romantic backdrop of picturesque Vienna. Now's the time to let yourself be pampered. As our guests of honor, you will also receive a bottle of sparkling wine to let you toast your new life together.